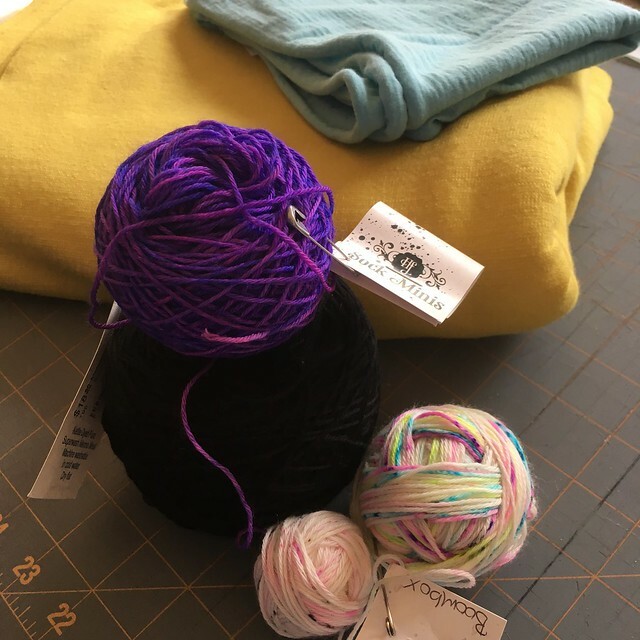 Ever since I discovered my love of sewing (and my proclivity to knit things that were WAY too big, even after making a gauge), knitting has really taken a backseat in my creative life. However, you hang out at a shop that sells gorgeous yarn long enough and you just might get tempted. So, thanks to Sip & Stitch and hanging around Pintuck & Purl, I started knitting again. One thing I am learning is that, at this point in my creative life, I’m more interested in making a finished object than the textile the object is going to be made from. This is interesting because in the time between knitting and sewing, I had dreams of being a fabric designer. I’m not ruling that out, but I think that my love of making a finished object over making my creative materials holds a clue as to why I may do more sewing than knitting. The truth is, though, that I’ve missed knitting. While I want to put most of my mental energy into improving my sewing skills, I miss having a simple, small knitting project going that I can work on while talking to friends or watching TV. So maybe for now I’ll knit hats and cowls. This project was yarn-led. I had a mini skein of Hedgehog Fibres sock yarn in Boombox. Someone like me who isn’t great at sizing and wants results quickly, has little business buying sock yarn, but the colors were so great that I couldn’t resist! The hand-dyed yarn these days is amazing! 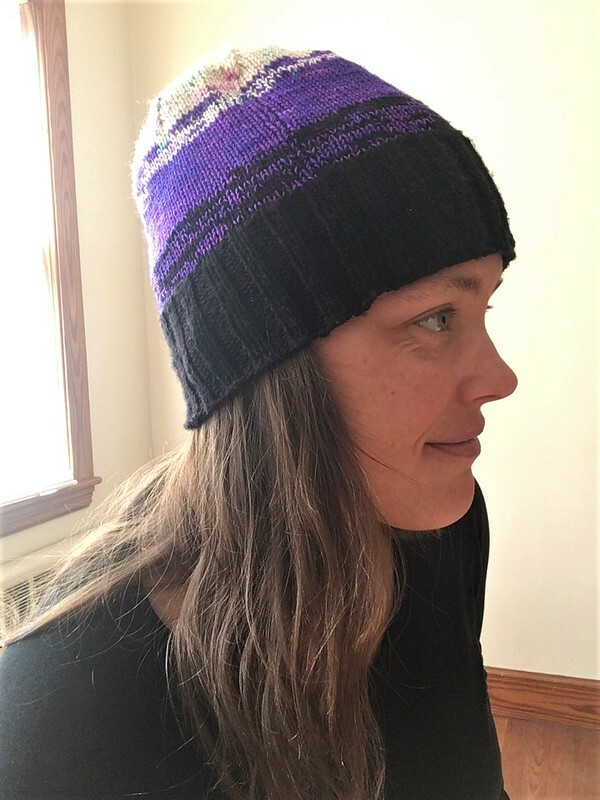 I stumbled upon this free hat pattern on the Hedgehog Fibres site after rejecting my first few ideas of how to use the yarn. This pattern was perfect for me. It would allow me to try out the super-cool fade technique that’s popular right now, but on a really small scale. 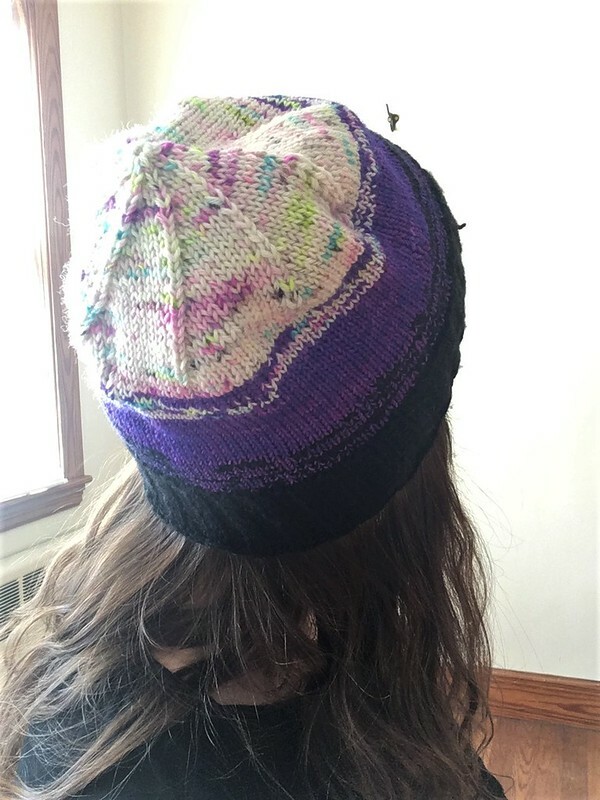 You get to hold the yarn double for this hat, which makes things go faster (or at least seem like they are going faster), and it’s mostly stockinette, so it’s perfect to work on while you talk to people. So, let’s talk about the hat. I took the time to make a gauge swatch (actually, several) because I tend to knit very loosely. I used this helpful blog post for swatching in the round to make sure my knitting would be accurate. In the end, I used size 1 (US) double-pointed needles for the main body of the hat, which meant using size 0 (US) double-pointed needles for the ribbing. This was my first time trying a fade, and if I were to do it again, I would choose my colors differently. 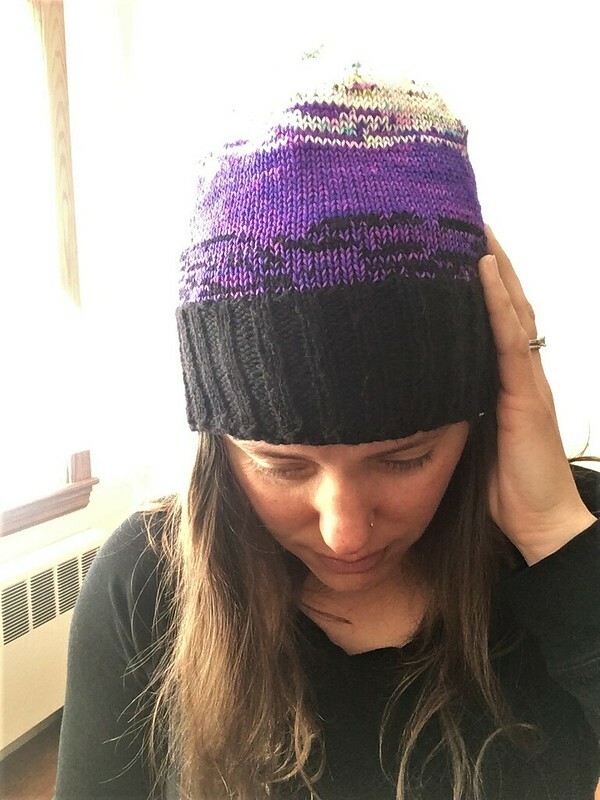 This looks more like messy stripes rather than a hat that fades from one color to another, but thanks to this project, I feel like I understand the technique a lot better, and could choose colors that would fade better next time. 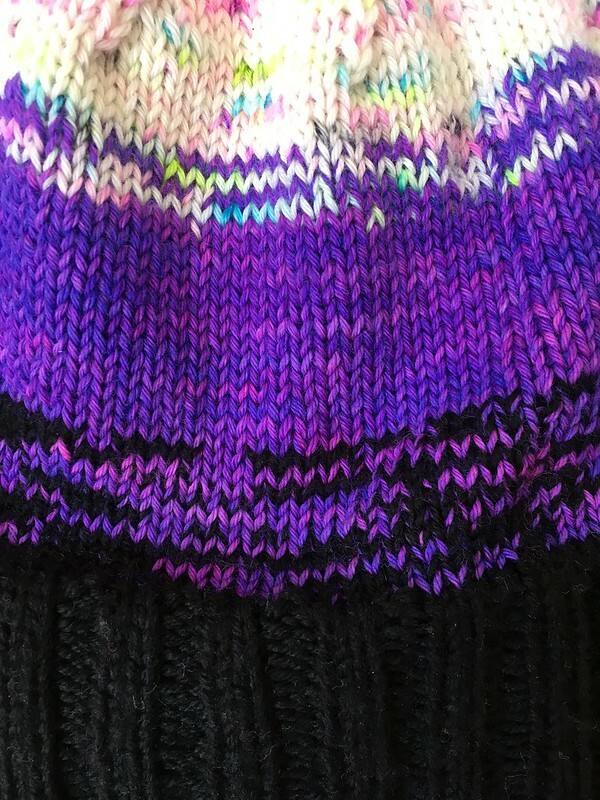 For yarn, I used black Malabrigo sock yarn for the ribbing at the bottom of the hat (Color A). Following the black yarn I used Hedgehog Fibres sock yarn from Pintuck & Purl in North Hampton, NH. The purple (Color B) is called Spell, and then the white with flecks (Color C) is a combination of Cheeky (white with black and pink flecks, left over from the light colored cowl in this post) and Boombox (white with many bright colored flecks). I ran out of the purple about a half-inch before I was supposed to change, so I just started the change earlier. I did make some mistakes at the very bottom of the ribbing, but I decided I could live with it and I moved on. (I like to ignore my mistakes when possible.) The Hedgehog yarn does like to split a little bit, but it wasn’t too hard to watch for that, and it didn’t become much of an issue. I’m really happy with my hat. This is probably the best fitting hat that I have made to date, and I would both recommend it and make it again. 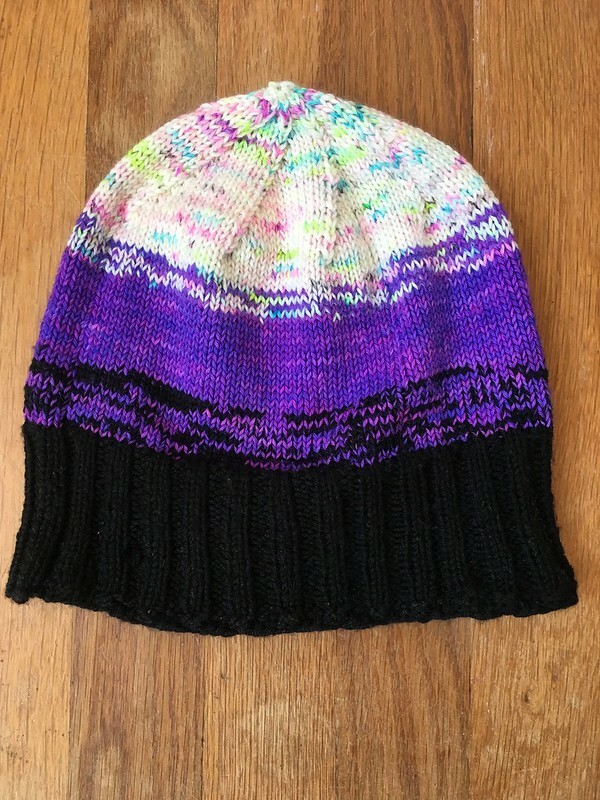 It’s a good way to use up odds and ends or mini skeins, and the fade is really fun. I love the knit fabric the sock yarn creates. It also doesn’t hurt that the pattern is free. And finally, if you are a Hedgehog Fibres fan and plan to use that yarn, the pattern gives you suggested colorways to help you create successful gradients, which is a nice touch. I’m so glad I tried this. I can’t remember where I saw this recommendation (maybe Sew News Magazine? ), but I just checked out Closet Essentials by Amber McNaught from the library, and it’s really fun! It’s a fashion book that shows different clothing items and gives you various ideas about how to wear and style them. I find it very inspiring for sewing ideas, even if I do already have a mental sewing list a million miles long!